Falcons Nest Estate is a spacious 4 level, 4 bedroom, 3.5 bathroom home located in the prestigious Blueberry Hill neighbourhood and features its own elevator. Situated on a corner lot at the end of a quiet private lane and surrounded by trees, this comfortable detached home is constructed in the classic log and beam style with vaulted ceilings and floor-to-ceiling windows in the main living room. To access the slopes with ease, this home also conveniently features a parking spot at the Pan Pacific Mountainside in Whistler Village. The master bedroom features a king bed, the 2nd bedroom has a queen bed, the 3rd bedroom has a queen bed and there are 2 sets of twin bunk beds in the 4th bedroom. 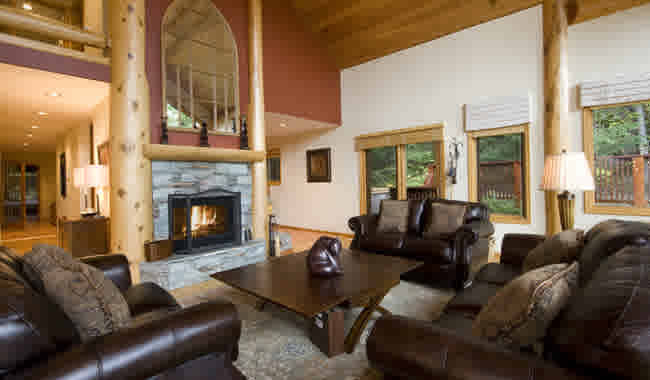 Enjoy the 10 person outdoor hot tub, gourmet kitchen and media room with large flat screen TV or for those who need to stay connected, there’s also a spacious office area.